Jim Richardson's stand-up comic photo & promotion packet requirements for comedy club work. do NOT send me your materials. Except as part of a one-on-one, coaching and co-writing appointment. •and stand-up comics auditioning for work from said producers. •an idea what the comedy producer needs to see in your promo packet. looking to book a clean comic for a corporation's annual convention. •This pays roughly 10 times what you get for club work. Never hold back giving relatively inexpensive promotional materials to the comedy producer. Because that producer can get your photo in many local newspapers. •An ad in that newspaper the size of your photo might cost several hundred dollars. The comedy producer does this for you at no cost to you other than the photo itself. Q: Can't I just sent the producer a digital scan of my photo? A: Ask the producer what he wants. which can be different from what you have been printing from your desktop printer? •If the producer will accept your digital scan, ask him at what d.p.i. should you print? ("Dots per inch" or d.p.i. is a carry over from the printing industry that is oddly still used today to mean "Pixels per inch" or p.p.i.). You may be used to printing out photos at 150 ppi at home. But a professional newspaper or magazine printer may start at 300 ppi, or higher. Reason: different newspapers and magazines have varying policies about what they will accept. •Many publications prefer to do their own photo scanning from glossy prints. i.e., created through traditional darkroom "wet" printing. The great master of "view camera" filters and printing paper was Ansel Adams. 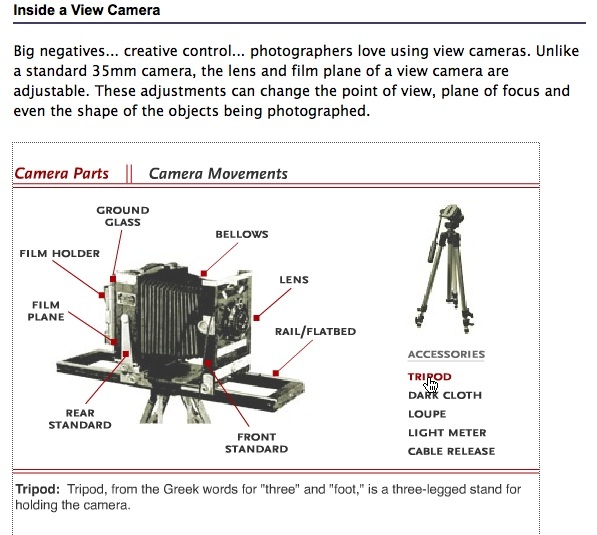 Click on the image below to check out this interactive explanation of the view camera used by Adams. •Flash player is required which is not available on Apple iOS devices like iPhone, iPodTouch and iPad. 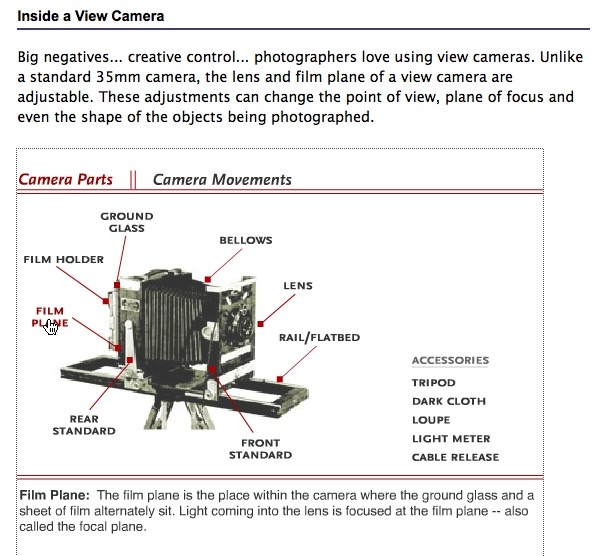 Note that in the first screen shot, the cursor is over the "Film Plane"
which prompts the definition of Film Plane below the image. In the second screen shot, the cursor is over the term "Tripod" under "Accessories"
In short, expect to plow 20% of your annual comedy income back into your business . . . on-going. which will hopefully pay off in succeeding years. See: the The Producer's "Audition Requirements" letter I sent out to comics auditioning for work. 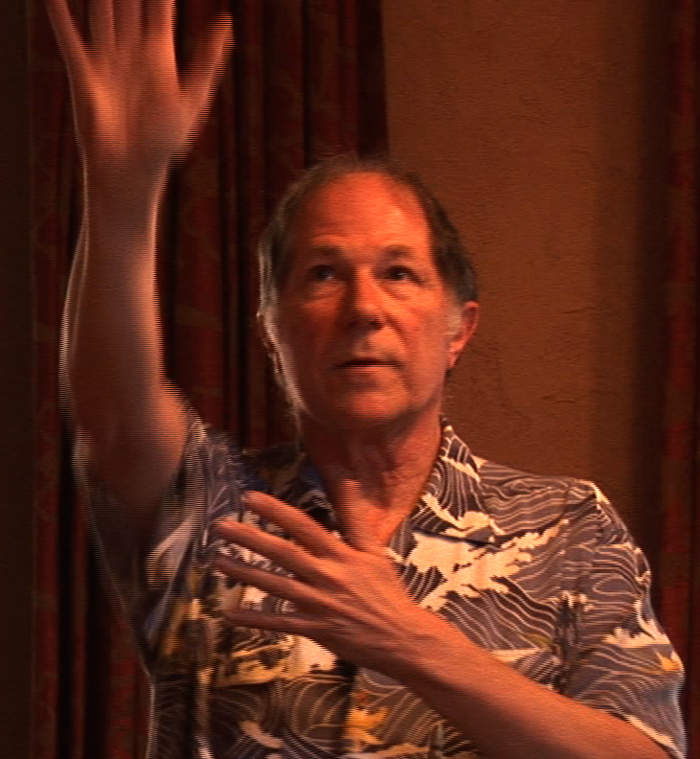 from the producer's point-of-view which will put you "in-the-know." I have checked my files. Yours is short the number of 8" x 10" black and white glossy photos I need to adequately promote stand-up comedy shows. Option: you may also include color photos. At this time, many of your previously sent photos may still be out to clubs and newspapers. Some get returned, some do not. at new venues in various cities throughout northern California. You currently have only _____ on file. Please make up the difference by immediately mailing me _____ more photos. 2) Middle Acts/Feature Acts/Openers, M.C. 's and Paid Guest Sets: 12 photos. You currently have only _____ photos on file. Please send me _____ photos ASAP. that you may have received since I last got such information from you. has changed, please send me an update on those as well. One copy of these items is plenty, since I can copy your original if I need extras. Thank you for your help with the business part of Show Business. encl. : Maps and directions to upcoming bookings you have made through ORGANIZED COMEDY. Page last updated: Monday, November 25, 2013, 3:31 pm PST and Sunday, January 6, 2019, 8:35 pm PST.